First-time anterior shoulder dislocations: has the standard changed? The traditional treatment of a first-time anterior shoulder dislocation of reduction and a period of immobilisation should be challenged. The purpose of this review is to assimilate and present the current literature on acute anterior shoulder instability. This involves consideration of the pathoanatomy, natural history and the more recent evaluation of treatment outcomes, which appropriately incorporate quality of life measures in addition to recurrences. There is ample evidence to consider primary stabilisation as an option for treatment in the high-risk group, less than 25 years of age. Traumatic anterior shoulder dislocations are a common problem facing the orthopaedic surgeon in practice, with an incidence rate of 1.7% in the general population.1 They are the most frequent type of joint dislocation, accounting for almost 50% of all joint dislocations presenting to emergency departments.2 Traditionally, initial management of anterior shoulder dislocations consists of a reduction of the glenohumeral joint, immobilisation and concomitant physical therapy to restore shoulder range of motion and strength. This traditional approach in management is being challenged, however, due to the high rate of recurrence, with reported rates as high as 92–96% in young active patients.3,–,5 Several recent studies have compared non-operative treatment with early surgical intervention and have shown a decrease in recurrent dislocation with arthroscopic stabilisation.6,–,11 This finding adds another level of complexity to the treatment algorithm of anterior traumatic shoulder instability. The purpose of this review was to assimilate and present the current literature on acute anterior shoulder instability, focusing on current treatment recommendations, thus providing the clinician with an updated framework for a discussion of what to do with the first-time dislocator. The shoulder relies on both static (osseous conformity, adhesion/cohesion, finite volume and capsular and ligamentous components such as the labrum) and dynamic (rotator cuff muscles) stabilisers to maintain joint stability through a wide arc of motion.12,–,16 With the arm in an abducted and externally rotated position, the inferior glenohumeral complex is the primary restraint to anterior glenohumeral translation (figure 1).16 During a traumatic anterior dislocation, the anteroinferiorly displaced humeral head stretches the capsuloligamentous components, often resulting in a detachment of the anterior-inferior labrum (the classically described Bankart lesion).17 Other findings may include bony Hill–Sachs lesions, superior labral tear from anterior to posterior (SLAP) lesions, capsular tears, rotator cuff tears and glenoid rim fractures. Cadaveric depiction of the glenohumeral ligaments and inferior glenohumeral ligament complex. Taylor and Arciero18 studied first-time traumatic dislocations in young patients (<24 years) and found 97% had Bankart lesions, with no gross evidence of capsular injury (figure 2). Eighty-nine per cent had Hill–Sachs lesions, but they were small and did not appear to have a significant effect on stability as evaluated arthroscopically. They also noted a 10% incidence of SLAP lesions and no rotator cuff tears. Baker et al19 and Norlin20 had similar findings in their respective studies on young (mean ages ~22 years) adults with initial traumatic anterior shoulder dislocations. Baker et al19 reported an 87% incidence of Bankart lesions and a 64% incidence of Hill–Sachs lesions. Thirteen per cent of their patients had isolated capsular tears, but those were all were stable with an examination under anaesthesia. Norlin20 reported a 100% incidence of both Bankart and Hill–Sachs lesions in his study population. 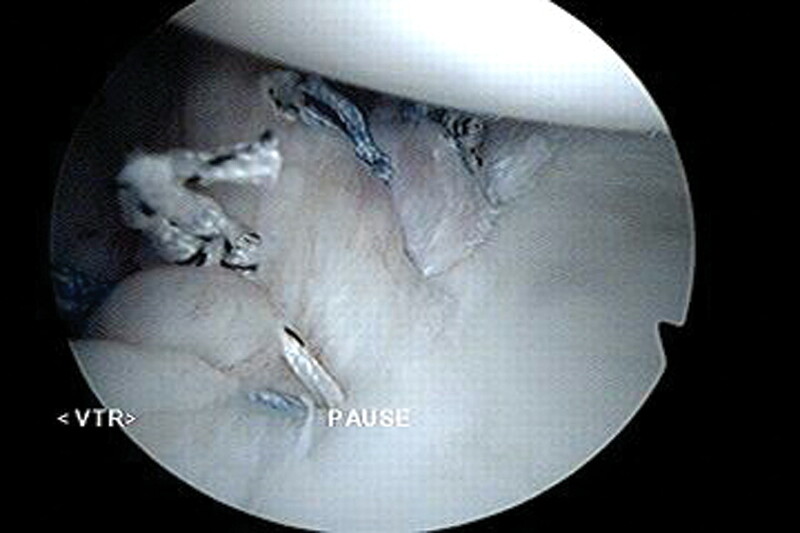 Arthroscopic view of a Bankart lesion without evidence of gross capsular injury. Antonio et al21 evaluated abnormalities detected in first-time anterior shoulder dislocators by magnetic resonance arthrography. They stratified by age (< and ≥30 years) and found that 82% of patients under 30 years of age had an anteroinferior labral avulsion, 71% had a Hill–Sachs lesion, 14% had a SLAP lesion and 39% had extensive labral detachment, which extended above the 3 o'clock position. Interestingly, they found that while young patients were significantly more likely to have extensive labral avulsions, they were significantly less likely to have rotator cuff tears (only a 2.9% incidence of cuff tears in patients <30 years vs 53% incidence in patients .30 years). When discussing the intra-articular findings of first-time shoulder dislocators and the rationale for treatment, an important consideration is the ‘cost’ of additional instability events. The cadaveric study of Pollock et al22 showed that repetitive loading of the inferior glenohumeral ligament, as seen in overhead athletes, induces irreversible ligament and capsular elongation. The authors suggested that repetitive subfailure strains led to an accumulation of microdamage within the ligament substance, leading to an ultimate decreased load to failure. Urayama et al23 showed that there was 2.6–6.7 mm of increased anteroinferior and inferior capsular elongation in young patients with recurrent traumatic anterior dislocations. Habermeyer et al24 studied a spectrum of patients with traumatic anterior shoulder instability, ranging from first-time dislocators to chronic subluxers, and found progressive labral-ligamentous injury and degeneration with increasing episodes of dislocation. The authors described four stages of lesion evolution in which there is sequential loss of the anterior ‘hinges’ (labrum and inferior glenohumeral ligament; IGHL) and then irreversible plastic deformation and degeneration of the anterior elements occurring by the third dislocation (which they termed the ‘point of no return’). In addition to progressive soft tissue injury, it also appears that recurrent dislocations can facilitate bony injury. Buscayret et al25 studied 570 patients who underwent an instability procedure and found that the development of postoperative arthritis correlated with an increased number of preoperative dislocations. They also identified that the presence of osseous glenoid rim lesions was a risk factor in the development of preoperative arthritis. A recently published computed tomography study by Griffith et al26 further studied the relationship of glenoid bone loss in anterior shoulder dislocations and found a prevalence of 41% in single dislocations compared with 86% of recurrent dislocations. Glenoid bone loss averaged 10.8% (or 3.03 mm) and was significantly more common and more severe in recurrent than in single dislocations. It would appear, therefore, that reducing the incidence of recurrent instability from a pathoanatomical viewpoint would be desirable. In order for the orthopaedic surgeon to discuss treatment options appropriately with a first-time dislocator, he/she must first understand the natural history of the process. The question then becomes ‘what is a good result?’ Recurrent instability has been the sole outcome measure for many years. However, other considerations such as continued apprehension, failure to return to work or sport, established quality of life outcomes measures and the development of post-traumatic osteoarthritis are critical in assessing the response to treatment. These factors all play a role in the decision-making of the treatment of the first-time dislocator. Hovelius et al35 recently reported on the results of a 25-year follow-up study on non-operatively treated anterior shoulder dislocations. They found recurrence in 72% of patients aged 12–22 years, 56% of those patients aged 23–29 years and 27% of patients older than 30 years. Thirty-eight per cent of patients aged 12–25 years eventually underwent surgical stabilisation for recurrent dislocation, with an additional 12% experiencing continued instability without surgery. Interestingly, they noted that 20% of patients aged 12–22 years with recurrent instability became stable 15–25 years after initial injury, and they subsequently suggested that while initial operative stabilisation may benefit this age group, they suggested that approximately 30–50% of patients would undergo unnecessary surgery. This is with recurrent dislocation as the primary outcome. This also assumes that all patients without recurrent dislocation have an excellent result. Robinson et al33 reported similar results with an 87% re-dislocation rate in patients under 20 years and a 30% rate in those over 30 years of age, further emphasising the importance of patient age on prognosis. Sachs et al36 attempted to clarify which patient population would be most likely to benefit from future surgery after an initial traumatic anterior shoulder dislocation. The authors prospectively followed 131 patients for 5 years, and found that the strongest predictor of subsequent instability was age less than 25 years. They noted patients who participated in a contact or collision sport (55%), and patients who used their arm at or above chest level in their occupation (51%), were also at a higher risk of re-dislocation. However, they found that less than half of these high-risk patients requested surgery, and concluded that early surgery, even in these high-risk groups, could not be justified. Interestingly, they found that those patients with continued instability who were ‘coping with it’ had significantly lower American Shoulder and Elbow Surgeons, constant and Western Ontario shoulder instability index (WOSI) outcome scores than patients with no recurrences or surgical stabilisation, suggesting a decreased quality of life. Hovelius and Saeboe37 recently published a report on the presence of arthropathy 25 years after a primary dislocation. Arthropathy was significantly more in patients who experienced recurrent dislocations (40%) compared with those patients without a recurrence (18%). Risk factors that were found to correlate significantly to the development of moderate/severe arthropathy included age older than 25 years at initial dislocation, high-energy sports activity as the aetiology of dislocation, recurrence and alcohol abuse. Buscayret et al25 had similar findings in their study evaluating arthropathy after anterior shoulder dislocation. The authors had an overall incidence of arthritis of 29% and found risk factors to be older age at the initial dislocation and at surgery, increased number of dislocations and longer follow-up. They suggested that as the number of instability episodes statistically influenced the development of postoperative arthritis, one might argue for earlier surgery to prevent recurrent instability. After a review of the recent literature concerning the natural history of first-time anterior dislocation, the senior author believes there is ample evidence to consider primary stabilisation as an option for treatment in the high-risk group, less than 25 years of age. This is based not only on recurrences but improved quality of life outcomes measures. The traditional treatment of reduction and a period of immobilisation can be challenged. The initial management of a traumatic anterior shoulder dislocation usually begins in the emergency room with reduction. Kuhn11 found level 1 evidence suggesting that intra-articular lidocaine is preferred as a premedication for reduction compared with intravenous sedation.38 While both methods had an equal success rate of 92%, the patients managed with intra-articular lidocaine had significantly reduced external rotation (ER) time and complication rates. He noted that with regard to the reduction technique, the evidence was very poor and trends could not be discerned, so he recommended that the physician use whichever technique he/she was most comfortable with. Many studies have reported on operative techniques and outcomes after acute traumatic shoulder dislocations varying from basic lavage to open stabilisation procedures. Lavage has been shown to increase the rate of resolution of the joint effusion, which has been thought potentially to facilitate healing of the labral detachment.47 In a prospective multicentre randomised study, Wintzell et al48 reported at 1 year follow-up a recurrence rate of 43% in the non-operative group compared with only 13% in the arthroscopic lavage group. Their findings were especially evident in the age group under 25 years, which had a 65% re-dislocation rate versus only 12% in the lavage-treated group. te Slaa et al5 looked at arthroscopic lavage in the treatment of first-time dislocators over a 5-year follow-up period. While they found similar results to Wintzell et al48 at 1 year, with an instability rate of 7%, by 5 years follow-up the overall instability rate was 55%, with recurrences occurring at an average of 27 months. This suggests that 1 year may have been too soon to detect recurrences, and the authors concluded that arthroscopic lavage did not reduce re-dislocation rates. Of note, they too found an influence of age on instability, with 67% of patients less than 25 years experiencing instability compared with only 30% in those older than 25 years. More recently, Robinson et al49 published level 1 evidence showing that arthroscopic repair of a Bankart lesion after primary traumatic anterior shoulder dislocation reduced the risk of recurrent dislocation by 76% when compared with arthroscopic lavage alone (7% vs 38%). Patients allocated to the repair treatment arm also had significantly better functional outcome scores (disabilities of the arm, shoulder and hand, WOSI), higher satisfaction and lower treatment costs. Although there was no difference between the two groups with respect to the number returning to sport and timing of return, there was a 3.4 × increased risk of discontinuing contact sports within the first 2 years after a primary dislocation in the lavage group (p=0.007). They concluded that there was a significant treatment benefit of primary arthroscopic repair of a Bankart lesion compared with arthroscopic lavage alone. Several authors have reported on surgical techniques of acute stabilisation after an initial traumatic shoulder dislocation, ranging from open treatment to arthroscopic repair with transglenoid sutures or anchors to the addition of a capsular shift.50,–,56 In 2000, Boszotta and Helperstorfer50 reported on the outcomes of 72 traumatic first-time Austrian dislocators who underwent acute arthroscopic transglenoid suture repair. Patients were chosen for surgery if they were less than 40 years old, desired to return to sporting activities, and had sonographic evidence of a positive ventral drawer test for instability. The technique involved one or two drill holes placed into the scapula at the 3 o'clock and 5 o'clock positions. In this select group at 5.5 years follow-up, they reported excellent results, and only a 6.9% rate of re-dislocation. Eighty-five per cent of their patients resumed full sporting activities, and they concluded that this treatment was highly effective in young athletic patients. This is a much better outcome than that reported by Kandziora et al,53 who retrospectively compared arthroscopic transglenoid suture fixation with the suture anchor technique, and found that 58% of their patients in the transglenoid suture group had to reduce their sporting activity, whereas only 16% in the suture group needed to. Suture anchor fixation was also associated with a significantly lower rate of re-dislocation (16%) than transglenoid fixation (32%). These generally higher recurrence rates than previously reported are probably due to the study population, which included patients with multiple recurrences before surgery. Several studies evaluating outcomes of arthroscopic suture anchor fixation for traumatic Bankart lesions have reported excellent results with lower recurrence rates, better return to activities and improved quality of life. Valentin et al56 reported on the results of early arthroscopic Bankart repair in 15 patients with an average age of 23 years. They found 93% good/excellent results at 18 months and 83% returned to their preinjury activity levels. Only two patients (13%) sustained re-dislocations by the 3-year follow-up. A study by Law et al54 recently showed a 5.2% re-dislocation rate at a minimum 2-year follow-up in 38 young traumatic first-time dislocators treated with initial arthroscopic Bankart repair using suture anchors. Ninety-five per cent of their patients had excellent/good results and they concluded that immediate arthroscopic Bankart repair with suture anchors is an effective and safe technique in this patient population. So, how do we appropriately address the treatment of the first-time dislocator? Does the literature advocate initial non-operative management or early surgical stabilisation? Bottoni et al6 prospectively studied arthroscopic stabilisation with bioabsorbable tacks versus non-operative treatment in the active duty military population. Both groups underwent a therapist-supervised three phase rehabilitation programme with restrictions on returning to full active duty, contact sports or overhead heavy lifting until 4 months postoperatively. Seventy-five per cent of those patients randomly assigned to non-operative treatment failed, and two-thirds required subsequent open surgical stabilisation. Single assessment numeric evaluation (SANE) and L'Insalata scores were significantly higher in the early surgical intervention group, and the authors concluded that early arthroscopic stabilisation with a bioabsorbable tack is more predictable with lower recurrence rates and improved outcomes in young, athletic patients (<25 years). This is consistent with results published on West Point cadets by Wheeler et al3 and Arciero et al.9 Wheeler et al3 reported a 92% failure rate with non-operative treatment at 2-year follow-up, compared with only 22% in cadets who underwent arthroscopic staple fixation of their Bankart lesion. Arciero et al9 utilised a transglenoid suture technique and reported a 14% failure rate, compared with 80% failure in his non-operative cohort at 3-year follow-up. Owens et al57 recently published a long-term follow-up on their case series of 49 young shoulders (average age 20.3 years) treated with acute arthroscopic Bankart repair using bioabsorbable tacks and found a 14% re-dislocation rate. They reported excellent subjective functional outcome scores with single assessment numeric evaluation, American Shoulder and Elbow Surgeons and Short Form 36 scores all averaging greater than 90 and WOSI scores 84% of normal. They concluded that treating young athletes with acute arthroscopic Bankart repair yields durable maintenance of shoulder function and stability, high subjective outcome scores and allows the return to a high level of activity. In addition to the study by Bottoni et al,6 there is further level 1 evidence in support of acute arthroscopic stabilisation in young first-time dislocators.8 10 Kirkley et al8 reported on 40 patients under 30 years of age who were randomly assigned to immediate arthroscopic transglenoid suture repair or immobilisation. At 3-year follow-up, they found a 47% recurrence in the non-operative group compared with only 16% in the surgical group. While they noted a significant difference in WOSI scores at 3 years (16% higher in the surgical group), by 6 years the difference was only 11% and was no longer statistically significant. They still felt that it was clinically significant, and recommended early surgical stabilisation in young, high level athletes who either play risky sports or the timing for surgery is good. A randomised controlled trial by Jakobsen et al10 of 79 patients (mean age 22 years), randomly assigned to open Bankart repair or conservative treatment, found at 10 years follow-up a recurrence of 62% in the conservative group compared with only 9% in the repaired group. They found 74% of conservatively managed patients had unsatisfactory results using the Oxford score while 72% of surgically repaired patients had good or excellent results. Interestingly, the members of the non-operative group who required eventual stabilisation surgery reported only 63% good or excellent results, further substantiating the argument for initial early surgical care. To summarise, a recent Cochrane review evaluating the level 1 evidence of non-operative versus operative treatment of acute first-time shoulder dislocations concluded that early surgical intervention was warranted in young adults (aged less than 26–30 years) engaged in highly demanding physical activities.7 They reported a 75% reduction of relative risk for subsequent instability in the surgical group in this high-risk patient population. Buss et al58 confirmed the potential benefit of early stabilisation in their case-series of the non-operative management of 30 in-season athletes who had experienced a traumatic anterior shoulder dislocation or subluxation. After completing a rehabilitation programme and regaining symmetric strength and range of motion, 87% of the athletes returned to play with a brace as appropriate to prevent abduction and ER and were able to complete their season. Unfortunately, the recurrence rate was 1.4 episodes per athlete per season and 66% eventually required surgical stabilisation within 6 months. After a review of the current literature concerning the pathoanatomy, natural history of first-time anterior dislocation and the more recent evaluation of treatment outcomes, the senior author believes there is ample evidence to consider primary stabilisation as an option for treatment in the high-risk group, less than 25 years of age. This is based not only on recurrences but improved quality of life outcomes measures. The traditional treatment of reduction and a period of immobilisation can be challenged. In those candidates pursuing operative repair, we prefer to perform the arthroscopic primary repair within 2 weeks of injury, because the tissue conditions are still optimal. In addition to the Bankart repair, we re-tension the IGHL to address any capsular stretching that occurred with the dislocation. We utilise the lateral decubitus position, with the arm in 5 lb of longitudinal traction and 7 lb of lateral traction (figure 3). A roll is placed under the axilla to allow easier visualisation of the 6 o'clock position. The posterior portal is created first, then the anterosuperior and anteroinferior portals are made using spinal needle localisation to determine appropriate placement. The labrum is elevated off the glenoid and the underlying neck is roughened with a rasp or burr. A ‘suture first’ technique is performed in which an ‘O’ polydioxanone is passed through the capsule and labrum at the 6 o'clock position. For a left shoulder, the first anchor is then placed at the 7 o'clock position, the number 2 suture of the anchor is shuttled through the capsulolabral tissue via the polydioxanone suture, and the anchor suture ends are then tied. By placing the anchor more cephalad than the shuttling suture subsequent knot-tying will re-tension the IGHL. Two more suture anchors are then placed in a similar fashion (figure 4). Lateral decubitus set-up for arthroscopic Bankart repair in a right shoulder. Note the large rolled towel in the axilla to grant better exposure to the 6 o'clock position. 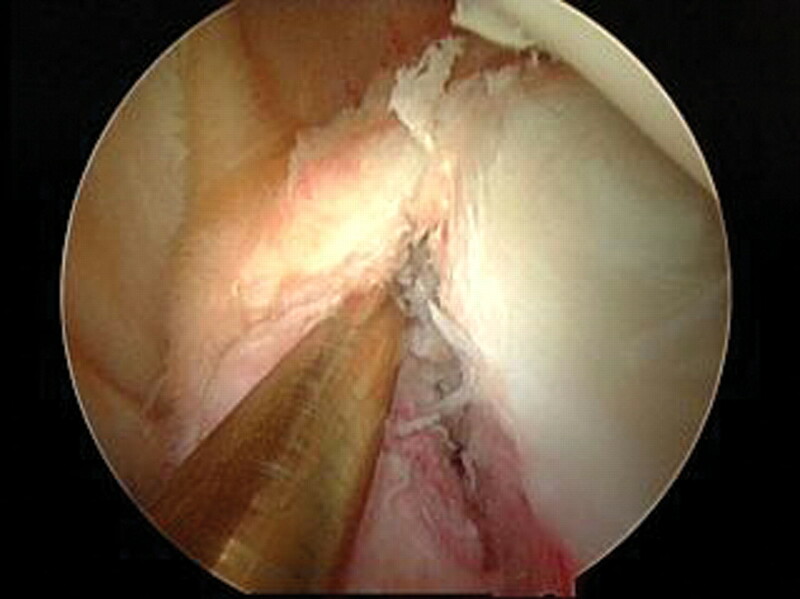 Arthroscopic view of a repaired Bankart lesion in a left shoulder. The anterior labrum has been reconstituted with three suture anchors. The postoperative protocol includes immobilisation with immediate initiation of pendulum exercises and active-assisted range of motion (ER 0–30°, forward elevation (FE) 0–90°) for the first 6 weeks. Active range of motion exercise is begun at 6 weeks with the goal of full shoulder motion by 12 weeks. At 12 weeks, once full motion has been established, strengthening exercises are started. Sports-specific training is begun at 16–20 weeks, with the return to contact sports between 20 and 24 weeks postoperatively. In treating an older patient (>40 years) with a primary anterior shoulder dislocation, we will initially immobilise them in a sling in IR for 2 weeks. At that time, we will re-examine them. If they have no active abduction, then we will search for associated pathologies such as glenoid rim fractures, greater tuberosity fractures, rotator cuff tears or axillary nerve/suprascapular nerve palsies (by repeat x-rays, magnetic resonance imaging, and/or electromyography/nerve conduction velocity (NCV) studies); which we will then address as appropriate. The treatment of first-time anterior dislocation of the shoulder involves a consideration of not only the incidence of recurrent dislocation but should be influenced by the quality of life and an evaluation of outcomes. Treatment should be based on the method that results in the best outcome, which is more complex than the single parameter of recurrent instability. Recent pathoanatomical features with the evolution of increasing soft tissue and bony defects, natural history utilising true outcomes instruments, and the risk of osteoarthritis with increasing episodes of instability support arthroscopic suture anchor repair especially in the at-risk group less than 25 years of age. This is a viable option that challenges the traditional standard approach of immobilisation as the definitive treatment.
. Traumatic anterior shoulder instability. Orthop Clin North Am 2001;32:399–409.
. Emergency department evaluation and treatment of the shoulder and humerus. Emerg Med Clin North Am 1999;17:859–76, vi.
. Arthroscopic versus nonoperative treatment of acute shoulder dislocations in young athletes. Arthroscopy 1989;5:213–17.
. Factors related to recurrences of anterior dislocations of the shoulder. Clin Orthop 1961;20:40–8.
. A prospective arthroscopic study of acute first-time anterior shoulder dislocation in the young: a five-year follow-up study. J Shoulder Elbow Surg 2003;12:529–34.
. A prospective, randomized evaluation of arthroscopic stabilization versus nonoperative treatment in patients with acute, traumatic, first-time shoulder dislocations. Am J Sports Med 2002;30:576–80.
. Surgical versus non-surgical treatment for acute anterior shoulder dislocation. Cochrane Database Syst Rev 2004;1:CD 004325.
. Prospective randomized clinical trial comparing the effectiveness of immediate arthroscopic stabilization versus immobilization and rehabilitation in first traumatic anterior dislocations of the shoulder: long-term evaluation. Arthroscopy 2005;21:55–63.
. Arthroscopic Bankart repair versus nonoperative treatment for acute, initial anterior shoulder dislocations. Am J Sports Med 1994;22:589–94.
. Primary repair versus conservative treatment of first-time traumatic anterior dislocation of the shoulder: a randomized study with 10-year follow-up. Arthroscopy 2007;23:118–23.
. Treating the initial anterior shoulder dislocation – an evidence-based medicine approach. Sports Med Arthrosc 2006;14:192–8.
. Glenohumeral stability. Biomechanical properties of passive and active stabilizers. Clin Orthop Relat Res 1996;:13–30.
. The intra-articular pressure of the shoulder: an experimental study on the role of the glenoid labrum in stabilizing the joint. Arthroscopy 1992;8:166–72.
. Dynamic anterior stabilisers of the shoulder with the arm in abduction. J Bone Joint Surg Br 1994;76:834–6.
. Glenohumeral instabilty. In: Rockwood C, Matsen F, Wirth M eds. The shoulder. Philadelphia, Pennsylvania, USA: WB Saunders, 2004:633–9.
. Stabilizing mechanisms preventing anterior dislocation of the glenohumeral joint. J Bone Joint Surg Am 1981;63:1208–17.
. Recurrent or habitual dislocation of the shoulder-joint. 1923. Clin Orthop Relat Res 1993;291:3–6.
. Pathologic changes associated with shoulder dislocations. Arthroscopic and physical examination findings in first-time, traumatic anterior dislocations. Am J Sports Med 1997;25:306–11.
. Arthroscopic evaluation of acute initial anterior shoulder dislocations. Am J Sports Med 1990;18:25–8.
. Intraarticular pathology in acute, first-time anterior shoulder dislocation: an arthroscopic study. Arthroscopy 1993;9:546–9.
. First-time shoulder dislocation: high prevalence of labral injury and age-related differences revealed by MR arthrography. J Magn Reson Imaging 2007;26:983–91.
. Effects of repetitive subfailure strains on the mechanical behavior of the inferior glenohumeral ligament. J Shoulder Elbow Surg 2000;9:427–35.
. Capsular elongation in shoulders with recurrent anterior dislocation. Quantitative assessment with magnetic resonance arthrography. Am J Sports Med 2003;31:64–7.
. Evolution of lesions of the labrum-ligament complex in posttraumatic anterior shoulder instability: a prospective study. J Shoulder Elbow Surg 1999;8:66–74.
. Glenohumeral arthrosis in anterior instability before and after surgical treatment: incidence and contributing factors. Am J Sports Med 2004;32:1165–72.
. Prevalence, pattern, and spectrum of glenoid bone loss in anterior shoulder dislocation: CT analysis of 218 patients. AJR Am J Roentgenol 2008;190:1247–54.
. Anterior dislocation of the shoulder in elderly patients. J Bone Joint Surg Br 1997;79:540–3.
. The fate of traumatic anterior dislocation of the shoulder in children. J Bone Joint Surg Am 1992;74:1242–4.
. Natural history of glenohumeral dislocation – revisited. Am J Sports Med 1982;10:135–7.
. Recurrent anterior dislocation of the shoulder. II. A comparative study. J Trauma 1967;7:191–201.
. Anterior shoulder dislocation in adolescents. J Shoulder Elbow Surg 2000;9:470–4.
. Prognosis in anterior shoulder dislocation. Am J Sports Med 1984;12:19–24.
. Functional outcome and risk of recurrent instability after primary traumatic anterior shoulder dislocation in young patients. J Bone Joint Surg Am 2006;88:2326–36.
. Has the management of shoulder dislocation changed over time? Int Orthop 2007;31:385–9.
. Nonoperative treatment of primary anterior shoulder dislocation in patients forty years of age and younger. A prospective twenty-five-year follow-up. J Bone Joint Surg Am 2008;90:945–52.
. Can the need for future surgery for acute traumatic anterior shoulder dislocation be predicted? J Bone Joint Surg Am 2007;89:1665–74.
. Neer Award 2008: arthropathy after primary anterior shoulder dislocation – 223 shoulders prospectively followed up for twenty-five years. J Shoulder Elbow Surg 2009;18:339–47.
. Intraarticular lidocaine versus intravenous procedural sedation with narcotics and benzodiazepines for reduction of the dislocated shoulder: a systematic review. Acad Emerg Med 2008;15:703–8.
. Primary anterior dislocation of the shoulder in young patients. A ten-year prospective study. J Bone Joint Surg Am 1996;78:1677–84.
. Conservative management following closed reduction of traumatic anterior dislocation of the shoulder. Cochrane Database Syst Rev 2006;1:CD 004962.
. Immobilization in external rotation after shoulder dislocation reduces the risk of recurrence. A randomized controlled trial. J Bone Joint Surg Am 2007;89:2124–31.
. Position of immobilization after dislocation of the glenohumeral joint. A study with use of magnetic resonance imaging. J Bone Joint Surg Am 2001;83-A:661–7.
. Which labral lesion can be best reduced with external rotation of the shoulder after a first-time traumatic anterior shoulder dislocation? Arch Orthop Trauma Surg 2009;129:299–304.
. Should acute anterior dislocations of the shoulder be immobilized in external rotation? A cadaveric study. J Shoulder Elbow Surg 2004;13:589–92.
. Arthroscopic observation of capsulolabral reduction after shoulder dislocation. J Shoulder Elbow Surg 2005;14:134–7.
. Survey of the management of acute traumatic first-time anterior shoulder dislocation among trauma clinicians in the UK. Ann R Coll Surg Engl 2006;88:454–8.
. Arthroscopic lavage speeds reduction in effusion in the glenohumeral joint after primary anterior shoulder dislocation: a controlled randomized ultrasound study. Knee Surg Sports Traumatol Arthrosc 2000;8:56–60.
. Arthroscopic lavage reduced the recurrence rate following primary anterior shoulder dislocation. A randomised multicentre study with 1-year follow-up. Knee Surg Sports Traumatol Arthrosc 1999;7:192–6.
. Primary arthroscopic stabilization for a first-time anterior dislocation of the shoulder. A randomized double-blind trial. J Bone Joint Surg Am 2008;90:708–21.
. Arthroscopic transglenoid suture repair for initial anterior shoulder dislocation. Arthroscopy 2000;16:462–70.
. Arthroscopic versus open treatment of Bankart lesion of the shoulder: a prospective randomized study. Arthroscopy 2004;20:456–62.
. Arthroscopic labrum reconstruction with capsular shift in anterior shoulder instability: improved midterm results by using a standardized suprabicipital camera position. Arthroscopy 2007;23:688–95.
. Arthroscopic labrum refixation for posttraumatic anterior shoulder instability: suture anchor versus transglenoid fixation technique. Arthroscopy 2000;16:359–66.
. The surgical outcome of immediate arthroscopic Bankart repair for first time anterior shoulder dislocation in young active patients. Knee Surg Sports Traumatol Arthrosc 2008;16:188–93.
. Arthroscopic inferior capsular split and advancement for anterior and inferior shoulder instability: technique and results at 2- to 5-year follow-up. Arthroscopy 2000;16:451–6.
. Early arthroscopic treatment of primary traumatic anterior shoulder dislocation. A follow-up study. Scand J Med Sci Sports 1998;8:405–10.
. Long-term follow-up of acute arthroscopic Bankart repair for initial anterior shoulder dislocations in young athletes. Am J Sports Med 2009;37:669–73.
. Nonoperative management for in-season athletes with anterior shoulder instability. Am J Sports Med 2004;32:1430–3.
. Arthroscopic repair of acute traumatic anterior shoulder dislocation in young athletes. Arthroscopy 2001;17:373–7.
. Incidence of rotator cuff tears in shoulder dislocations and results of therapy in older patients. Arch Orthop Trauma Surg 2006;126:235–40. Competing interests RAA receives educational/research grant funding from Arthrex. JLB has no competing interests.